Santa Anita in Arcadia California will play host to the Grade 1 Breeders' Cup Juvenile Fillies Turf this Friday, October 31. Some of the best two year olds in the world will take to Santa Anita's turf track and go one mile as they chase the winner's share of the $1 million purse. The Breeders' Cup Dirt Mile is on tap for Santa Anita in Arcadia, California the Friday, October 31. Horses three years old and upward will take to Santa Anita's dirt track an race one mile searching for the winner's share of the $1 million purse. 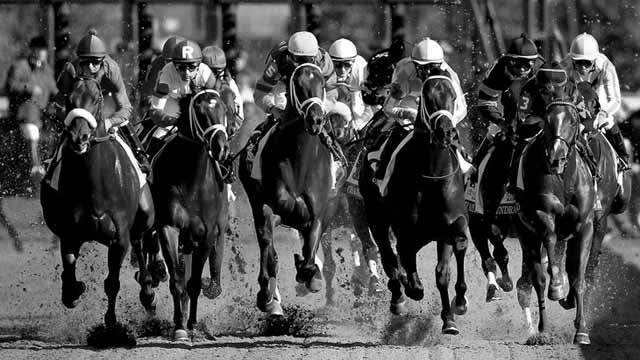 The 2014 Breeders' Cup at Santa Anita kicks off Friday, October 31. One of the races contested on that day will be the Grade 1 Juvenile Turf - a one mile test for some of the best two year olds in the world. A purse of $1 million will be on the line. Belmont Park in Elmont, New York will be the scene of the Grade 3 Turnback The Alarm Handicap this Sunday, October 26. Fillies and mares three years old and upward will be after the winner's share of the $200,000 purse when they go 1 1/16 miles on Belmont Park's dirt track. The Grade 3 Autumn Miss Stakes is on tap for this Saturday, October 25 from Santa Anita Park in Arcadia, California. A purse of $100,000 will be on the line for three year old fillies willing to go one mile on Santa Anita's turf track. The Grade 2 Hagyard Fayette Stakes comes our way from Keeneland Race Course in Lexington, Kentucky this Saturday, October 25. Horses three years old and upward will take to Keeneland's dirt track and race 1 1/8 miles for the winner's share of the $200,000 purse. Belmont Park in Elmont, New York will play host to the Grade 3 Bold Ruler Handicap this Saturday, October 25. Horses three years old and upward will be featured as they dash seven furlongs on Belmont Park's main track for a purse of $200,000. Woodbine in Toronto, Ontario will play host to the biggest race of the weekend - the Grade 1 Pattison Canadian International Stakes on Sunday, October 19. Horses three years old and upward will take to Woodbine's main track and go 1 1/2 miles searching for the winner's share of the very nice $1 million purse. The Grade 1 E.P. Taylor Stakes comes our way from a busy Woodbine in Toronto, Ontario this Sunday, October 19. Fillies and mares three years old and upward will be featured when they saddle up and go 1 1/4 miles on Woodbine's main track searching for the winner's portion of the $500,000 purse. The Grade 3 Sycamore Stakes is on tap for this Thursday, October 16 from Keeneland in Lexington, Kentucky. Horses three years old and upward will be featured as they go 1 1/2 miles on Keeneland's turf track searching for the winner's share of the $100,000 purse.